Writers, artists, criminals, and many more. Mervyn Peake, novelist and illustrator, moved to Wepham in 1937 with his wife Maeve and young family. His father was the doctor in the village, with a surgery in what is now Reed Thatch. In 1940 Mervyn moved next door into a small thatched cottage (Number 94 Wepham) where he completed the first of his Ghormenghast trilogy, Titus Groan. He based his ideas of the castle not on Arundel, but on the Imperial Palace and Forbidden City in Beijing, where his father had practised medicine. His son, Sebastian Peake, said that they used to walk around Burpham thinking of names for the characters in Ghormenghast. John Cowper Powys lived at Warre House from 1902 until the 1920s, and devoted a chapter of his autobiography to life in Burpham and pen portraits of a number of villagers including Tickner Edwardes. You can find here some newspaper articles with recollections by Lily Brooks, mother of a Burpham resident. Tickner Edwardes (1865-1944) was known as "the bee-man of Burpham", but he was also the vicar here for many years, and baptised some of the current residents. His books on bee-keeping, such as The Lore of the Honey Bee, are now classics. Red Cottage at Burpham was his home for many years, but he also lived in Burpham Country House, then the rectory, during his ministry at Burpham. His novel Tansy, about a beautiful village girl who upsets farming traditions by becoming a shepherdess, was made into a film in 1921. Alma Taylor played the star role. It was directed by Cecil Hepworth, a famous director of the day, who later went bankrupt, and his films were melted down for the silver nitrate. Fortunately 'Tansy' still exists in the British Film Institute. 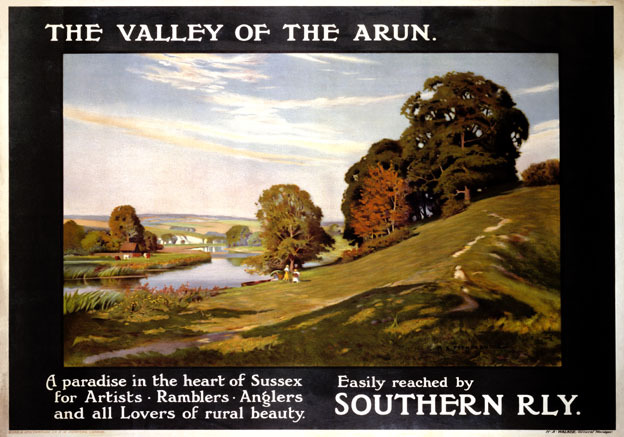 It was filmed in Burpham , and as far afield as Pulborough. This route devised by Betsy Ellis in the 1920s, visits the film's locations. Tickner Edwardes was known as 'the Thomas Hardy of Sussex'. We do have some famous local resident writers, but prefer to respect their privacy! George Petherbridge painted this lovely example of railway art. Most of Burpham and Wepham's tales can be found in books by local historian Chris Hare, and in the book 'Good Old Days, Bad Old Days: The Sussex of Lawrence Graburn. Graburn wrote under the name of Newall Duke in the West Sussex Gazette. You can find tales of Jack Upperton, who attempted to rob the mail in 1771 and murdered the postboy, and was hung on a gibbet for his pains.